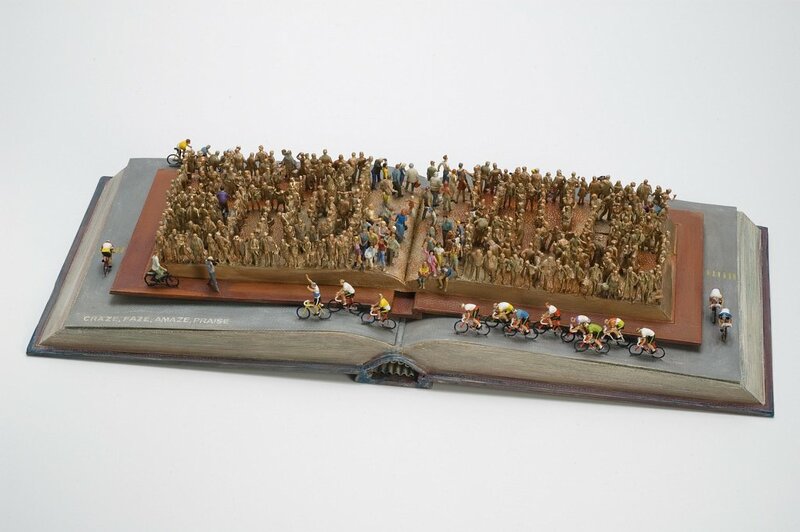 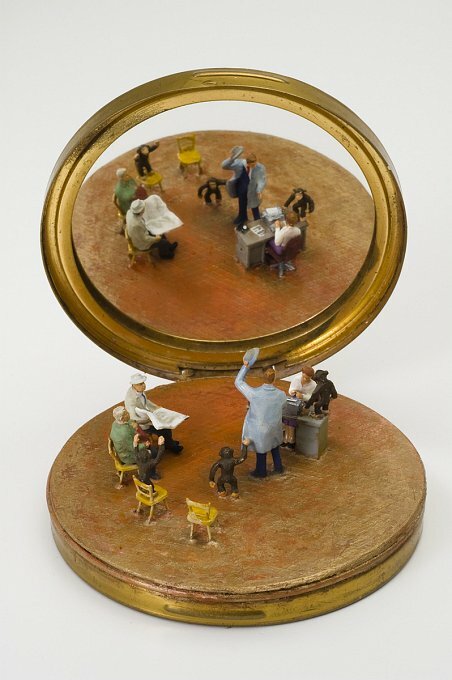 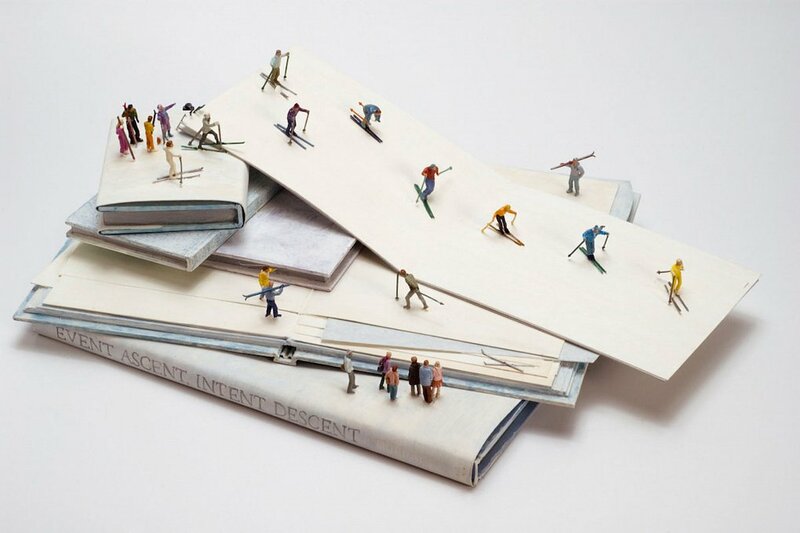 In the collection of artworks in the exhibition "Short Stories and Tall Tales", playful, dream like narratives are performed by a multitude of miniature identities with big personalities, all of which can be held in the palm of your hand. 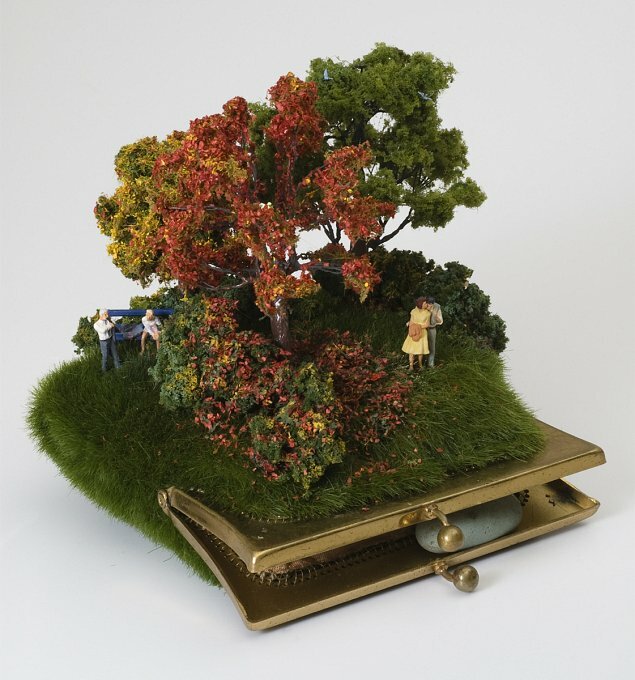 Each scenario offering the delight of the unexpected, the puzzle of a question posed and the possibility of a dream escape. 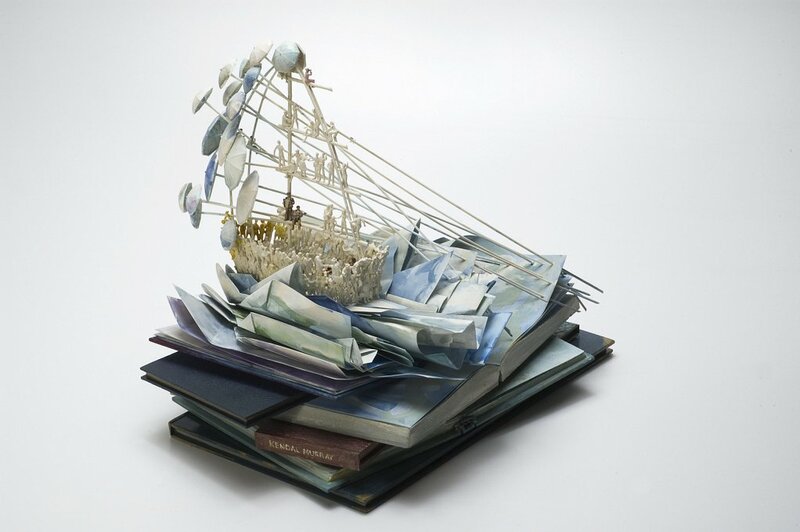 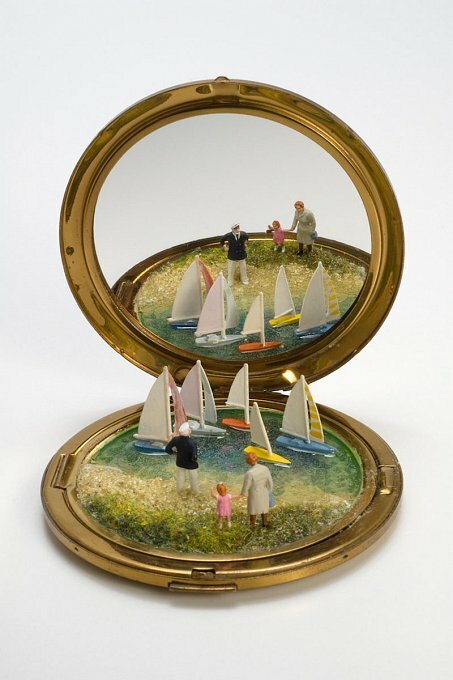 The assemblage of book forms in "Sugarcoat Sailboat, Dreamboat Afloat" opens to tell us the tale of a dreamboat with sails formed by a multitude of miniature umbrellas to carry the sleeping couple to distant lands, with a group of gold suited musicians serenading them as they sail through the pages of fantasy narratives and possibilities. 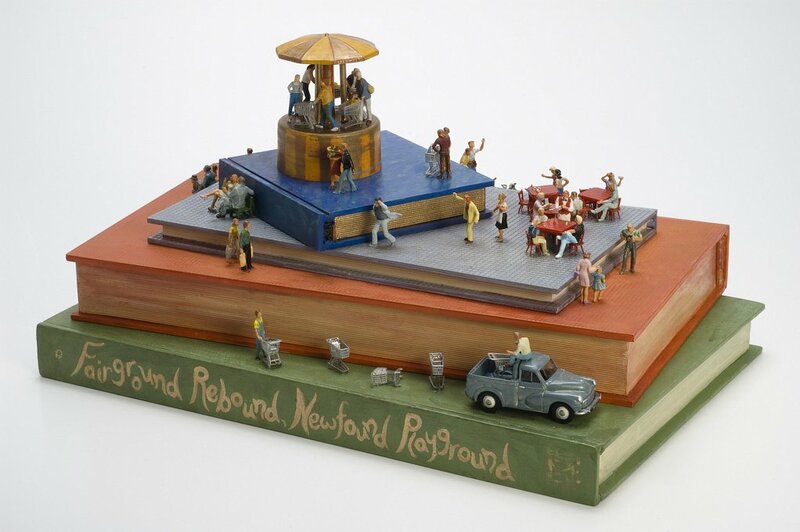 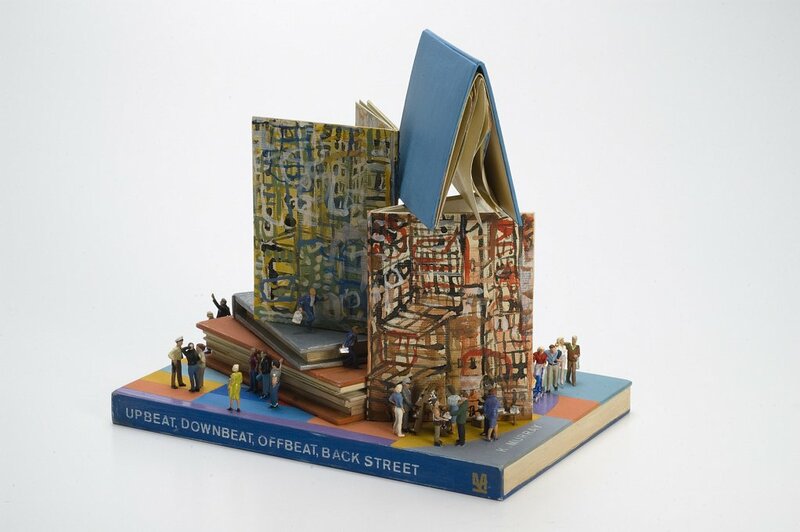 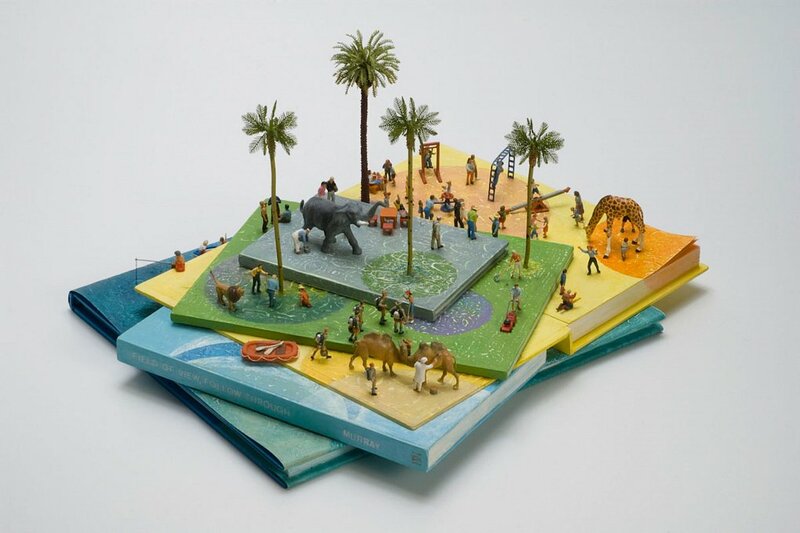 "Upbeat, Downbeat, Offbeat, Backstreet" shows an assemblage of small books configured to show scenes of a busy market place where the rhythms and energy of the city are being played out through a number of everyday dramas. 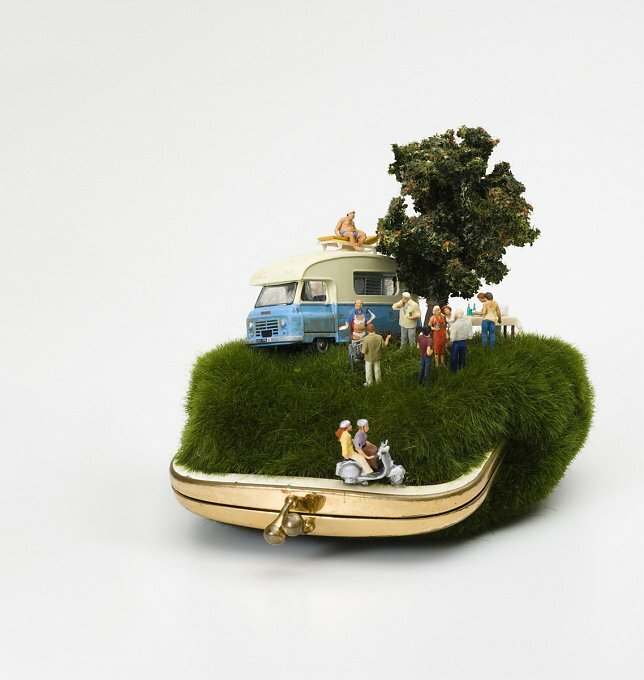 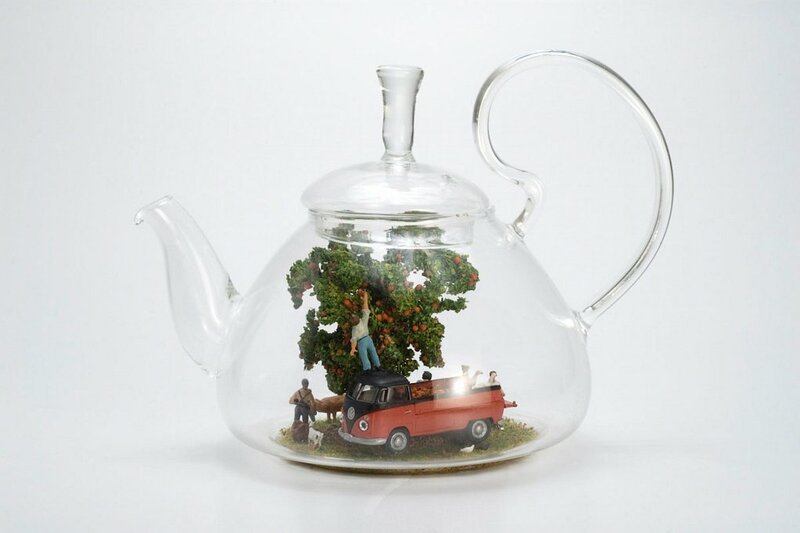 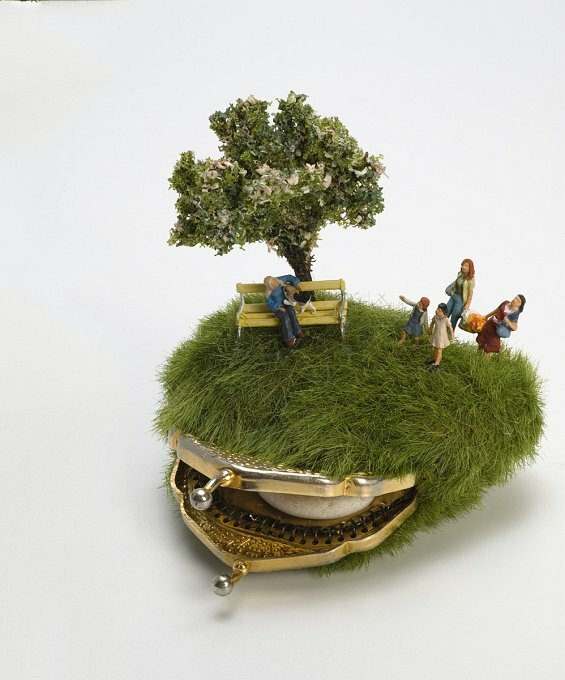 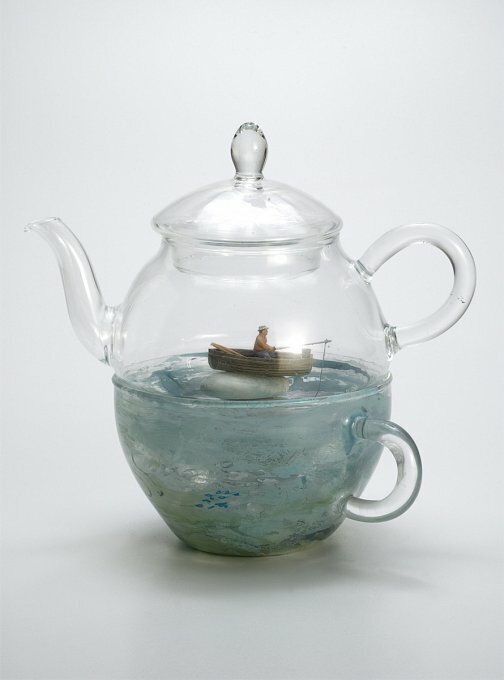 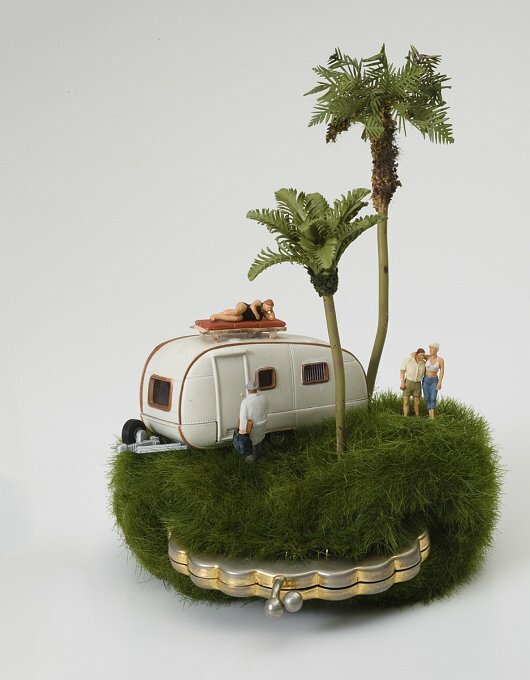 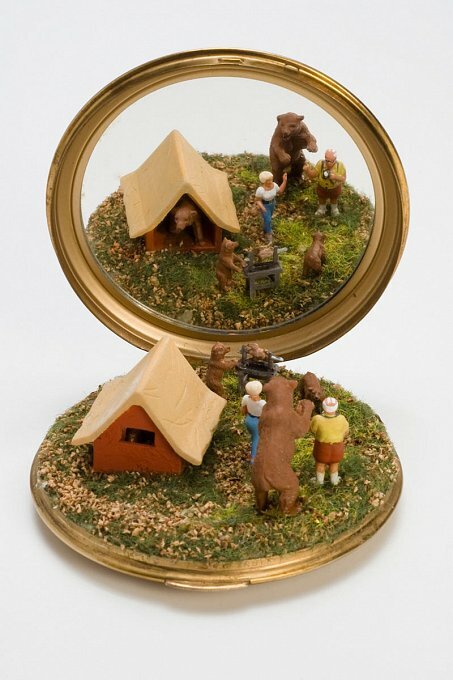 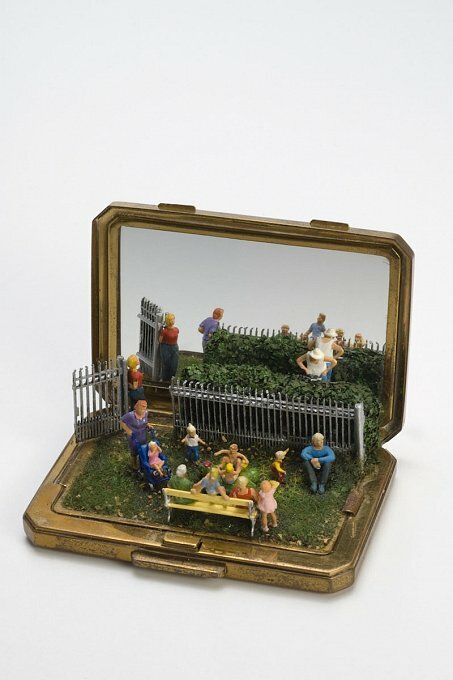 The fantasy escape is proposed in the artwork "Birthday Suite Salute" by a caravan positioned on an island like grass covered purse, offering its owner a space of his own, where he can be himself, if only he could be left alone. 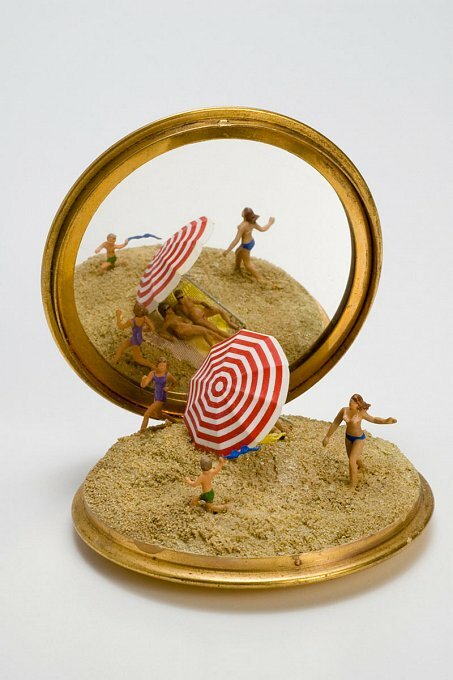 "Holiday Heyday" suggests another offer of escape. 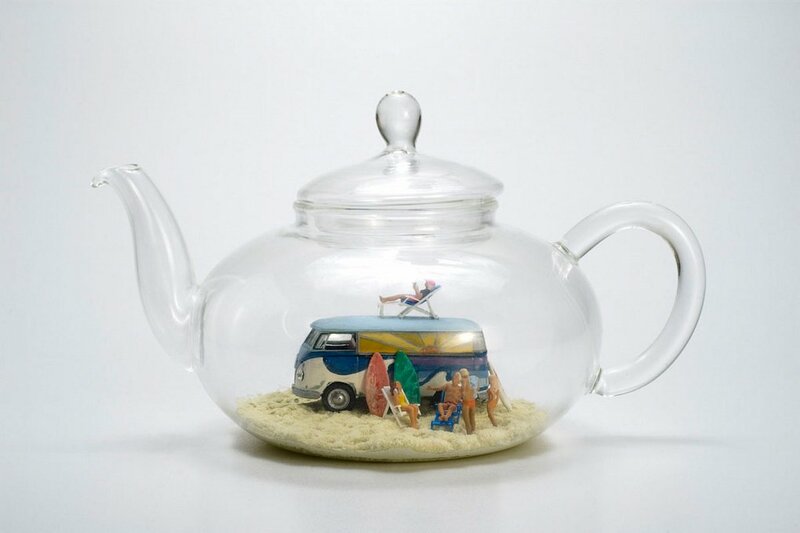 The caravan offering a romantic interlude, or just another door on which a salesperson can knock? 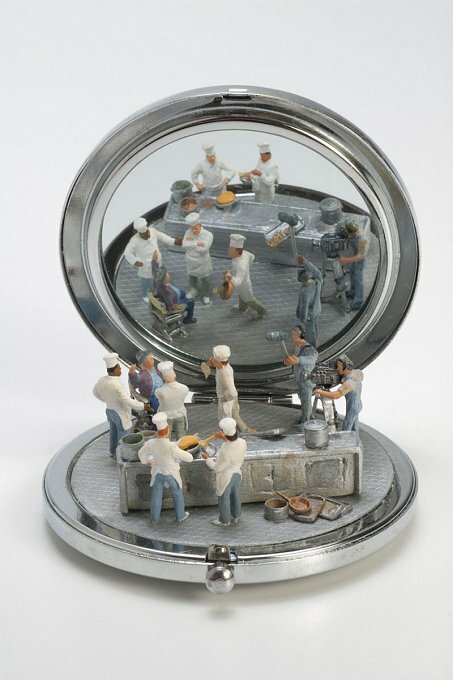 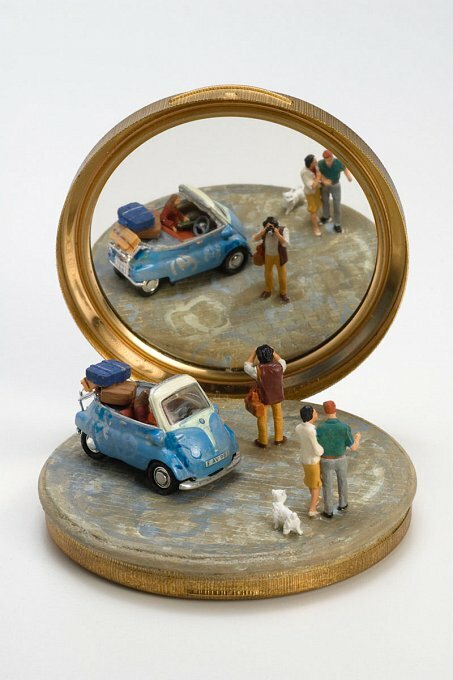 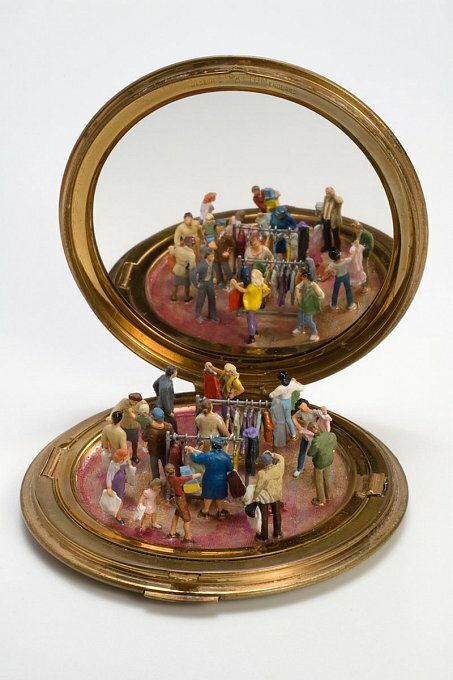 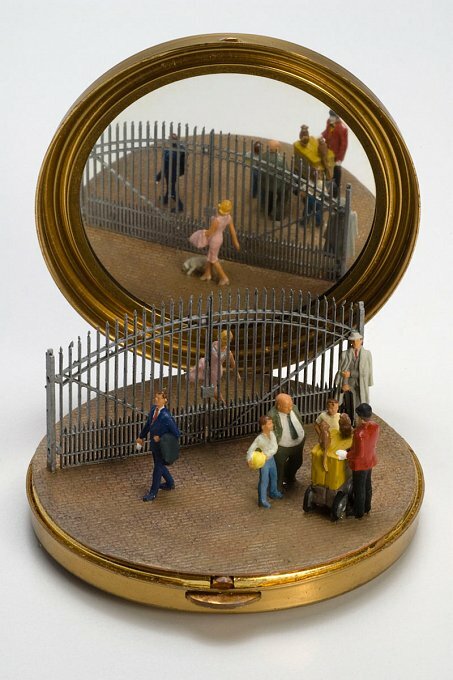 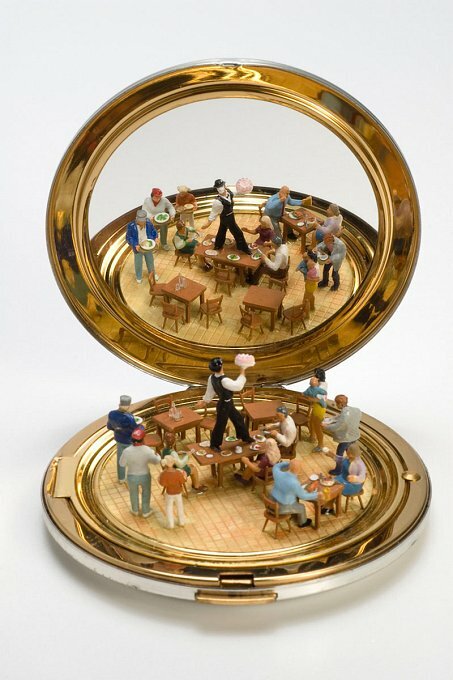 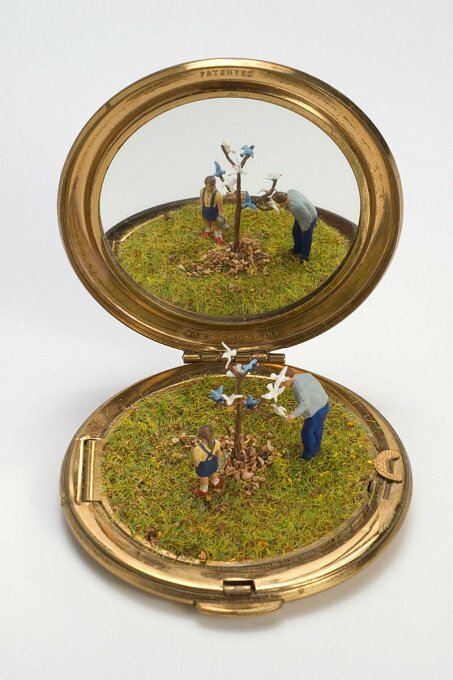 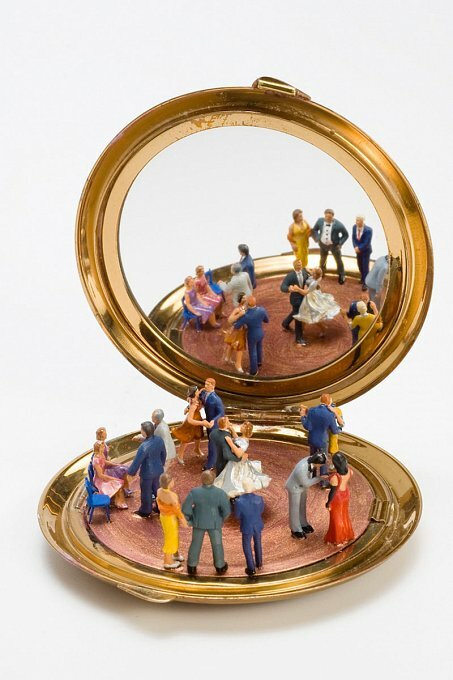 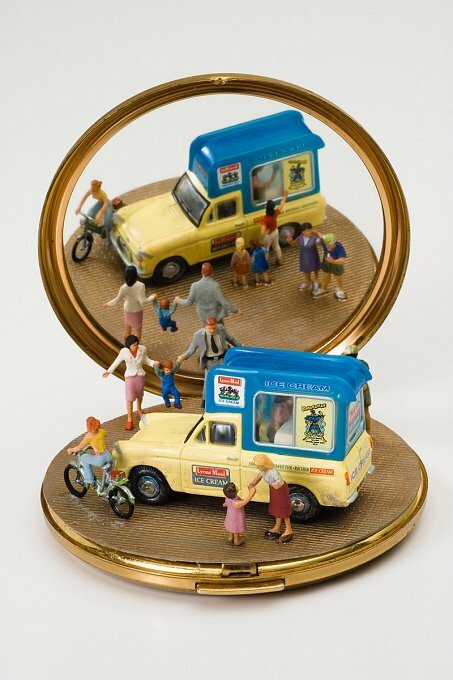 Mirrored compacts open to show us humorous tales of our own idiosyncrasies. 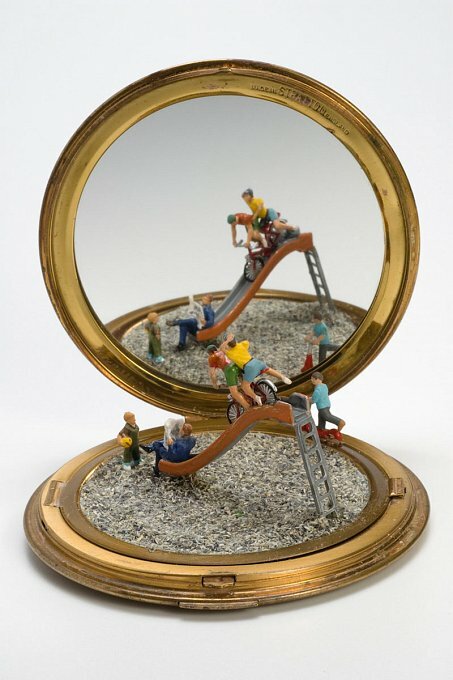 Eccentric possibilities are played out in everyday situations, whimsically exposing the foibles of our own fantasies. 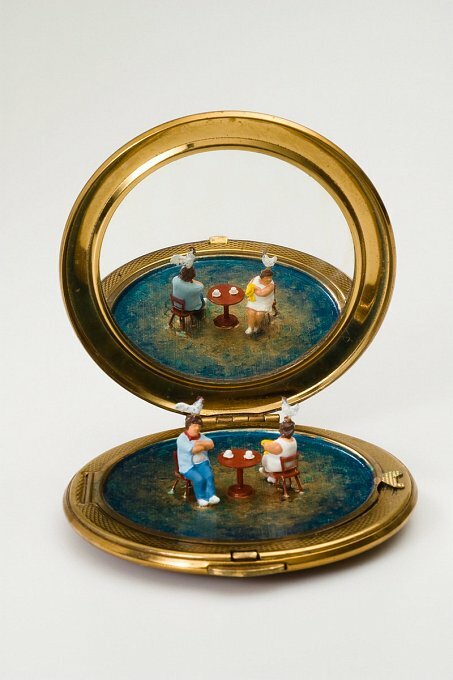 "Stricken Chicken" shows us a couple playing chicken and not wanting to give up their unique point of view, while "Love, Dove, Hand In Glove" shows us that through loving attention, unspoken hopes and wishes might come true. 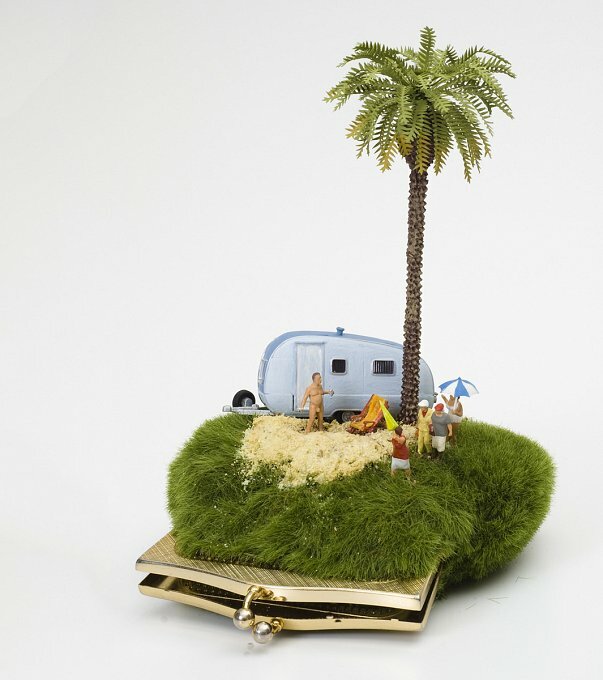 The surfer tells tall tales about his last surf to an avid listener in "Wide Eyed, Pride Confide", while the lone fisherman still takes pleasure from his attempts to catch a prize fish even though he himself is caught in his boat, on top of a sea covered mountain of rocks in "Small Boat, Pleasure Note".